Happy days are here again - housing is working itself out of its doldrums and stocks have been surging for the past several years. I know my retirement accounts are looking much healthier so with my cup half fully, why do I worry about the half that is empty? Perhaps it is from recently reading Michael Lewis’ Boomerang: Travels in the New Third World or maybe it was a recent Facebook posting chirping an explanation of the fiscal cliff or perhaps it was Greece coming around to the brink of default once again. The convergence of these 3 events lead me to wonder, "what if the housing meltdown is merely a prelude to a larger event?" 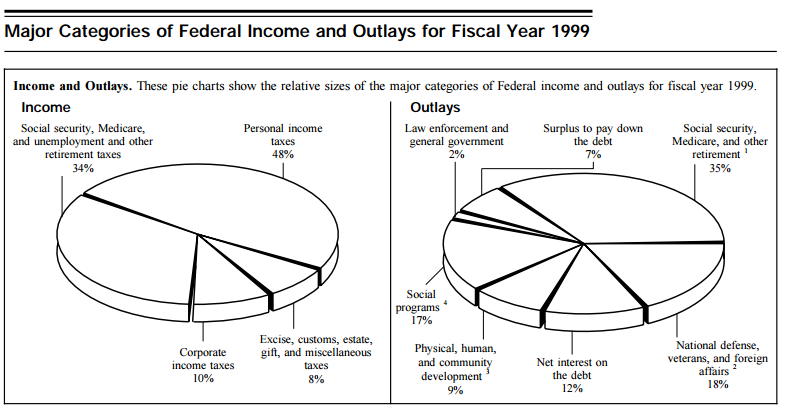 One of the interesting tidbits that are provided in our (United States) annual tax (1040) instructions are 2 pie charts reflecting major categories of Income and Outlays for the federal government. I thought it would be interesting to grab some of these charts from the past 15 or so years to see if I could spot any warning signs. After a quick internet search, I was able to produce the following charts for 1990, 1994, 1999, 2004, 2009 and 2013. (This was purely an unscientific grab, trying to space out years and avoid years where there may have been an atypical event such as in 2001...although in thinking about the past 15 years and the "tech wreck, 9-11, 3 wars, the housing melt down and government bailouts who knows what a "typical" year looks like). 1. More often than not the United States borrowing to pay its bills. 5 of the 6 years that I examined clearly identified substantial deficit spending (borrowing to cover the deficit) – 18% (1990), 14% (1994), 18% (2004), an eye popping 40% (2009), and 20% (2013). 2. The outlay for Social Security, Medicare and other retirement is steadily and substantially increasing. In my samples it started at 31% (1990), 35% (1994), 35% (1999), 36% (2004), 34% (2009) and 41% (2014). This was not surprising and 2 factors quickly come to mind as suspects. First, Medicare Part D was implemented in 2006 which added pharmacy benefits to Medicare beneficiaries. Secondly, the Baby Boomers (those born 1946 – 1964) represent an era of higher than average births and now Boomers (including myself are headed into retirement). If you assume average retirement ages of around 65, then the first “boomers” entered retirement as of around 2011. As of this year, 2015, only those born up to around 1950 are heavily into their retirement years, leaving most of this generation yet to weigh in for retirement benefits. 3. When I first thought to perform this quick exercise, I was anticipating a smoking gun that would unequivocally point to our impending fiscal cliff. 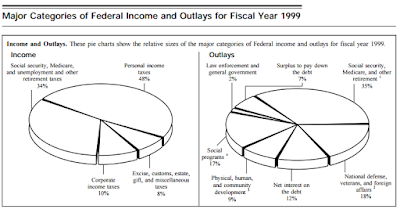 I presumed that when I did my quick look I would either see a growing chunk in our Outlays to service the National debt or I thought that I would find that the IRS had scuttled these pie charts to obscure the disaster. I found neither, but I quickly learned that percentages don’t tell the whole story. Looking at net interest to service the debt through the years by percentage doesn’t look too bad – A quick look at my sample yielded 14% (1990), 14% (1994), 12% (1999), 7% (2004), 5% (2009), and 6% (2013). It would be easy for one to look at these results and conclude “hmm, we were spending around 14% of our total yearly outlay on interest back in 1990, but now we only pay around 5-6%... things are getting better.” This would be misleading. Most notable the cost of borrowing is substantially different (lower) now than it was in the early 1990s. A mild rise in the cost of borrowing can quickly impact this area. Second, analyzing percentages fails to clarify the underlying debt. For example (assuming a constant interest charge for borrowing), if your total outlay in Year 1 is $100 and 10% of this outlay is interest on your debt ($10 was paid to service your debt). Now suppose your total outlay in Year 9 is $200, but only 7% of this outlay is used to service debt. Some may argue that your debt is in better shape due to it consuming only 7% of your budget where it used to consume 10%; however, in Year 9 you are paying $14 in interest to service debt (which is greater than the $10 that debt had cost in Year 1). Long story short is that “net interest on debt” as represented merely as a percentage of total Outlay is a poor indicator of financial position; it is also important to know the actual total amount of the underlying debt. The smoking gun may not leap off the page from these charts; however, if you consider the household budget analogy from the fiscal cliff citation and apply it to 6 years of household budgets, I don't think anyone could say with a straight face that a family that is significantly borrowing 5 out of 6 years is doing well (see #1 above). One has to wonder how much longer a government can continue to borrow to pay for promises that continue to significantly grow in cost.